I’ve had a regular slot in my blog schedule where I share something I’ve been doing recently and for the most part this has varied. I have been considering with book 3 that it might be fun to post everything here as I go. Not only would it be a great motivator for me to write regularly but it also means you, the readers, will get to see the whole writing process I go through, right from the start to the finished published book. It also means as readers you can be involved in the whole process. Don’t like something, comment and let me know. Love something and want to make sure its there for the final cut, comment too. What about book 2 I hear you cry? Well that’s almost finished so should have first draft out of the way before I want to start on this, although it will need the odd edit here and there it should be mostly finished. Book 3 is possibly going to be a new genre as well. I wish to try and turn my previous blog post on forming ideas into a plot for a whole series of books. It seemed fitting that the idea was first mentioned here for it to be the book I try. So what do people think? Something you would love to read? Ideas on how I could do it and opinions on the initial idea would be much appreciated. As I’ve already said on my blog recently, I am a big fan of these types of films and books. There is something I’ve always liked about adventures at sea. I went to see On Stranger Tides the day it came out here in the UK. The first thing I was struck by, as I sat watching, was the lack of slapstick gags in comparison to the second or third film. I actually thought this would be a good thing, but I have to admit, it wasn’t. There was something lacking in Jack Sparrow because of it. Like the new writer hadn’t quite managed to get his head around Jack the same way the old writer had. It was almost like they obeyed the many fans of the first, saying the second and the third were too silly and not serious enough. That alone wouldn’t have been too bad. The first Pirates film got the balance right between a serious plot and Jack’s rather special outlook on everything. Unfortunately they went too far and took out the very essence of Jack. There were no really special Jack Sparrow escape plans or one liners. Not only was the slapstick gone but the special mad Jack moments were as well, at least until right at the end. There was one final line that was quite Jack. Nothing really quotable though, unlike the previous three. In every other respect the film wasn’t too bad. The plot was pretty good. Typical pirates type plot. One really bad pirate that all the other pirates have to stop and some fun, who’s side are you on anyway, moments. It was a little predictable in places but that’s fairly inevitable with the 4th in a series. You just get to know the characters well enough by that point to predict them. Ian McShane made a very good Blackbeard and you could hardly tell it was Lovejoy under all that makeup and wig. So this for me was a plus. He’s definitely improving as an actor. Though still not perfect. With Jack being not quite Jack, however, my favourite character ended up being the missionary that was on Blackbeard’s ship. He was there as the only survivor of a ship and crew Blackbeard had attacked because his first mate wanted Blackbeard to be redeemed and have his soul saved from hell. A rather interesting premise from a pirates first mate. It did mean there were a few really good chances for the Christian aspect to shine through, as they actually did a fairly good job of portraying a Christian’s beliefs. And without giving spoilers that’s probably all I can say. I have to admit I came out feeling a little unsatisfied. It was better than the 2nd and 3rd pirates but still not quite as good as the first. I’m hoping it’s a film I will like more on a second viewing though. I imagine with it being based on a book there is some more subtle stuff to be gleaned from the plot and characters. I also will still go see any more they make at the cinema as they did set it up for potentially a more Jack mad sequel. Maybe they can get the balance right for the next one. They are obviously trying to. As some of you readers are well aware I’ve been promoting my book a lot more lately. I’ve found that so far approximately 50% of my sales can be traced back to a post, comment or status by me somewhere on the internet. While I’m thankful to see my hard work paying off I know that it shouldn’t really be that high. The reason being, readers and other people that like the book should be doing more of that kind of selling than me. The biggest way books are sold is from word of mouth. The recommendation of a friend or someone in a book shop. Unfortunately with a fresh author it’s difficult to get the kind of level of word of mouth needed. So I’ve had an idea, (ok I admit I have mostly nicked this idea from JA Konrath, self published success story making almost $1 mill from his own self publishing sales per year) I want to reward people for encouraging others to buy my book. Several of my readers and friends have already come to me and said things like, ‘yesterday I was chatting to this person and I told them about your book, they said they would check it out.’ So the simple thing I want to do is reward people for recommendations that turn into sales for me. When friends fans and readers have managed to sell 10 of my books to their friends and acquaintances I’ll put them in the acknowledgements of the next book I finish. If they manage 25 I’ll name a minor character after them. If they manage 50 I’ll name a major character after them. If anyone manages to go above that I’ll start thinking of other awesome things I can do to thank the people doing it for me. I do expect people to be honest though and to keep a track of how many people have actually bought the book because of your recommendation. Future books and shorts will also count as well as anything else that might lead to a sale like an audio book. With the character naming I will obviously try to name nice characters but depending what I am writing at the time of the achievement I can’t promise I won’t kill the character off or anything like that. Most importantly, however, while I do appreciate the help in spreading the word about my books, please don’t recommend the book to everyone all the time. Not everyone is going to enjoy a swashbuckling tale of adventure on the Caribbean sea’s of the early 1800’s (they might be a tad weird if they didn’t, but not everyone is the same). I would much rather people were telling others about my books because they enjoyed them and genuinly thought the person they were telling would too. This is just a cool way I can say thanks for doing so and perhaps a small incentive for mentioning it here and there. Also please don’t do this just becaue you’ve decided you like me. Do it because you like the book. Finally, I would prefer you to inform me when you hit these targets. I won’t chase anyone up. There are already too many of you. I don’t mind being updated occasionally of your current totals though and I’m happy for this to be retroactive. Thanks for all the people already helping in this way. Once a book, film script or other piece of work is finished it’s very rarely in a perfect state for selling. There is always something that needs editing or changing slightly, and those pesky spelling mistakes not picked up by spell checker because they are still a word. There are a lot of indie authors publishing their books and not paying for an editor first. While this can work if the author has acquired plenty of help editing themselves it can still leave some mistakes. Here’s a list of things you can do to minimise the mistakes that slip through the net. Leave it for a month or two and come back to it. Get several friends and fans to read over an advanced copy of the manuscript. Read it aloud to yourself. Write it out by hand. Often when writing the author can get very attached to what they have written, snippets of conversation, and the way they have described something. Putting the manuscript on a shelf for a short while and coming back to it can help give a fresh perspective on what is actually necessary and what isn’t. Sometimes we have to cut out parts we like because they aren’t helping progress the story along at all. It can also be helpful if we have time to forget some of those paragraphs that we’ve worked on so much we’ve memorised them. Knowing the manuscript too well can lead to errors being missed because our brain automatically tells us what it should be. This is one idea I thoroughly recommend people use for two reasons. Other readers are less attached to your work and it can be a great way to reward fans. There are a lot of people who, once they have already decided they like your work, will be very eager to help you out in return for getting to read your new books before anyone else. They are also going to be the most forgiving of any mistakes you do make as they will feel like they can help you put it right. I’ve found this is one of the best methods of catching mistakes, especially things like wordy sentences and monologues. I also recommend this is done in all film manuscripts long before it finds it’s way into the hands of any prospective actors or investors. You’ll be surprised what seems right on the page but sounds very wrong the minute you speak it out. I’ve found that reading out loud can also help with the placement of punctuation. Most comma’s and full stops go in the sensible pauses you take while reading aloud. Sometimes you can find you have placed too many commas in a sentence or two few and the whole emphasis can be lost. While the above methods are all useful, the human brain is a little too clever for every mistake to be spotted. The brain naturally corrects things it knows to be wrong. This can often mean repeated words can be missed, as well as words being slightly out of order, and letters within words being in the wrong order. To stop the brain correcting things it can help to read the book or film manuscript in reverse order, checking each word as you go. I’m not entirely sure I’d actually recommend this type of proofing if all the above have been done, however, it was something I did. Yup you heard me right. I wrote my entire book out by hand when I had finished it. It was a present for a very awesome friend and fan of mine for Christmas. I had a really thick leather bound journal and wrote a personal letter to them on the front page and filled the rest with my book. While I was writing I had to concentrate so hard on writing it out word for word that I noticed quite a few mistakes and could correct them. It was mostly useful for using the same word too often but I also caught quite a few punctuation errors and formatting errors that way. I am not sure if I would actually write out future books by hand though. Everything I have listed above does help with editing and getting the book up to scratch and I can’t stress how important it is that any book goes through a very rigorous editing process. The best way of course is to pay a professional editor, and to be very careful which one you choose, but I understand not every writer can always afford to do so, especially with the first few books. There are a lot of people still very prejudiced against indie books because of their lower standard of editing, however, so it is in every indie author’s best interests to make sure their book is as spelling and grammer mistake free as they possibly can. It also can’t help to do so when applying to agents and traditional publishers either. The Fairy Godmother’s Guide To Finance For Couples by Lisa Deckert is a non fiction book I was requested to read as part of a review swap with the author. I don’t normally read non fiction but seeing as my husband and I are a fairly newly married couple and I know a lot of new couples I thought this would be worth checking out. Financial planning doesn’t have to be hard to do – or hard to talk about. In this little book, the Fairy Godmother teaches couples how to share their dreams and turn them into goals. She gives them the tools they need to reach their goals, from IRAs to life insurance, all in a simple and easy to understand style. I was really very impressed with the depth this book went to whilst keeping the financial planning as simple as possible. It had a very wide range of different ways to manage money, invest and plan for the future, going through every financial aspect of a couples journey together, including that first budget, buying a house and the ever ominous will. Although it was geared towards the US in terms of savings bonds and stocks, there are highly likely to be equivalent things in most countries so it was very practical and relevant. I would definitely recommend all couples that are starting to get their finances merged and plan to live the rest of their lives together to take a good read of this book. At the very least it should get you talking about the things important to each of you and give some direction and motivation to saving for the future. 5 out of 5 stars for this one. I’ve always been mildly fascinated with pirates, I love the adventure and romantic aspect of them. Needless to say I also really liked The Pirates of the Caribbean films. It was only natural really that my first novel should have some in (even if they are the badguys in my book). Last night I, like a lot of other peeps in the Uk, went to see the fourth Pirates film. I’ll do my review here in a few days so watch out for that one as I’ll probably go quite in depth. In celebration of having a new pirates film(based on the book On Stranger Tides), however, I have lowered the price of my own tale of swashbuckling adventure to only 99 cents or 70p. For 87k words and approx 250+ pages that’s a bargain price. At the end of the month I’ll be raising the price again, so if you’ve not bought it yet now’s the time. For those few people that know me they know I really love my social computer games. Mostly MMO’s. Normal MMO’s consist of a social group aspect to running around hunting monsters, some kind of mining or resource gathering and some crafting abilities to make the clothes armour or tools players use. Most people choose to do the first for the largest period of their playing time. A few people do the other two more often but it is often a little boring in comparison to the quest/mission system the game will have around hunting. World Of Warcraft is the best example of this kind of MMO. I’m not really your normal MMO player, however. I don’t like World of Warcraft and even though there are elements of WoW in Entropia I don’t tend to play them at all. Entropia is different to most MMO’s because it has what is called a real cash economy. Mostly this means there is a direct way to convert in game cash to real cash and vice versa. There is no subscription fee it just costs the in game dollers, Project entropia dollars, PED, to hunt, mine or craft. 10PED=$1 and if you have at least 1000PED in game you can transfer it out for $100. You can also transfer $10 in for 100PED if you wish. Every gun shot uses ammo which costs in game money, every mining probe you drop costs money and everything you craft uses resources that cost. If you play sensibly and work withing your budget and in game skill it can be expected that any activity will return on a long term average about 90% of what you used in ammo, probes or resources. Everything you make, mine or loot however has two values attached to it. It has the game value that the little trade terminals will give you for the item (it’s TT value), which is what you measure the 90% by. On top of that, however, all items have another value assigned that players will pay above the TT value of the item (markup), and this can often determine whether you make money or not. Assuming you’ve gone on a hunt with 50PED of ammo and your loot’s tt value comes to 45PED as the average dictates, if the markup on the 10PED of animal hide you looted is 160% you can sell that hide to another player for 16PED instead of back to the game for 10PED. That would give you an extra 6PED and make your total take home 51PED. Now you’ve made money. While this very very rarely happens on the lower end of the game when you hunt the things only low skilled people can hunt, there are a few very high skilled players that can hunt and loot so many items with high mark up on a regular basis that they earn enough money to live on every month. This isn’t why I play the game either though. The game has many other ways an inventive player with a bit of sense and a good head for numbers can make money. Firstly and foremostly there is always an option in an MMO to be a trader of sorts. There is always some kind of auction or shop system in all games. In Entropia this is fairly easy as they have player owned shops and a way to buy two resources, combine them using a in game tool, and sell the resulting product for slightly more than the resources and tool use cost. I’ve also found hunters will occasionally pay another person to run around after them as they hunt with a first aid pack, making sure they don’t die. When the hunt is over the person healing gets paid the decay of their first aid pack and a tip. Seeing as the healer gains valuable first aid skills and gets paid for doing so this can be quite a relaxing and social way to spens a few hours. Often a lot of conversation goes back and fourth between healer and hunter. But how do you do either of these while working? Well in truth I don’t. Trading and healing are activities I reserve for when not working. While I am typing up hand written manuscripts, however, I like to do something called gathering sweat. Yeah I know it sounds gross and theoretically it is I suppose. Basically you stand in a circle with a bunch of other people aiming your sweat gun at a great huge sweaty monster and let it beat you up while your tool drags all the sweat off it and stores it in a bottle. When the monster has no sweat (takes about 5-7 minutes) you drown the thing in the nearest lake and find another. While its just dragging sweat I can go do something else then pay attention for ten seconds till I’ve got a new monster in focus and continue on with my work for 5-6 minutes, rinse and repeat. The sweat bottles are then sold to other players for a mark up and made into something the players can use to teleport around with. Voila I’ve made a little bit of the in game cash to have fun with later and all while I was working. I do only do this on off days though when I’m havign touble focusing and I am just typing up something I wrote a while ago. I find I have to shut of all distractions if I am writing something new. So far however my entropia net worth from the above three activities amounts to approx 2800PED which is $280 or approx £160. Not bad considering I’ve never transfered money in and I only play it for fun. Never Saw It Coming by Mike Jordan is a sci-fi action book available on amazon kindle. I was asked to review this book by the author in exchange for them reviewing my book. Everyone knows someone like Tim Finnegan. Just a guy, barely scraping by. Someone with too much squandered potential. Someone with not enough of anything, aside from anger and resignation. He works too hard for too little, and would prefer to be left alone. He lives a seemingly joyless existence. It’s much worse for him, because he knows what he had, and exactly how he lost it all. Things get worse, however when a band of miscreants known to the media as the Jackson Five decide to rob a bank as he’s walking out, two weeks worth of not-enough in his back pocket. They discover trying to rob a man like Tim Finnegan was a mistake. Tim discovers getting shot in the face really ruins the week. Things get worse for Tim when he awakes two days later, his bullet wound completely healed, and plagued by precognitive visions. Common wisdom dictates that people fear what they don’t understand, and it’s safe to say Tim Finnegan scares the hell out of himself. Unfortunately for him, he scares the hell out of a lot of other people as well. In short order he finds himself running from the Law, the scumbags that shot him, a group of whack-jobs calling themselves the Disciples of Nero, who want nothing more than to watch the world burn. The Reverend Father Jonathan Blake, however, believes that Tim may be the Second-Coming, or the Anti-Christ. Then, and only then, does Tim forge his own path. Only one thing is certain: They never saw it coming. I really enjoyed this book and found the fast pace and well thought through progression of it was amazing. The main character was very likable and his devotion to the female he loved was incredibly endearing. I also totally loved the way the last page ends. Plot wise I was hooked from right at the start and it didn’t let go until the very last word. It reminded me a lot of Dean Koontz and as he is one of my favourite authors that’s no bad thing at all. Based on plot and characters alone I want to give this book 5 stars. I really was very impressed by it, however, I am afraid I can’t. There were a few minor things for me that took the edge off what would have otherwise been a perfect book. Firstly I got very lost knowing where the characters were all the time. They seemed to travel a lot but always seemed to be in the same town. For someone running from the cops this seemed a little odd and had me very confused at a few points. Secondly I found there were a few too many grammar and spelling mistakes in it for me. I’m quite sensative to those, however, so don’t expect that to put everyone off. I’ve definitely seen a similar amount in more traditionaly published books. Thirdly as a Christian I found the few anti-christian references a little annoying. At one point the book very firmly suggests that Tim is just another incarnation of Jesus Christ and for me that was taking the anti-christian a little too far. I know almost all sci-fi in nature does not lend itself to being very Christian but this one went a little too far. So I’d recommend this book more for non-Christians. That leaves me giving this book 4 out of 5 stars. Disclaimer: I was in no way paid for this review or otherwise persuaded to give a favourable book review, this is entirely my own opinion. Late yesterday I had an author interview with me go live on Freelance and Fiction’s blog, you can check out my interview plus lots and lots of other author interviews there. Great place if you are looking for new authors to read. I’ve been working hard with my very talented aunt-in-law, Anne Mountifield (she’s doing most of the hard work to be fair), on designing a costume for a period piece flight needs and I’m pleased to say we’ve almost finished one of the most important components; the corset. Corsets are a hard part of historical design to get right, they changed very frequently through the ages and there are very few really good examples of them left from each era. Fortunately Anne has an old workwoman’s guide on making clothes from that era and I had one made for me for my wedding from a similar era to what we needed. 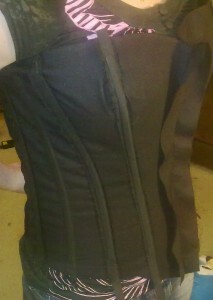 Here’s me wearing the inside layer, each strip down the side is where we placed a steel spiral bone. The big seam down the front is where the hooks and eyes, to get in and out, will be sewn in. 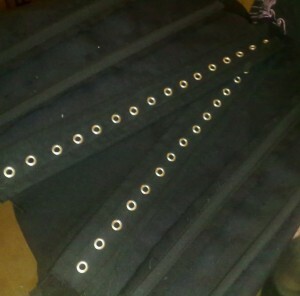 There are 16 eyelets down each side of the back with thinner flat steel bones both sides of the eyelets for strength. 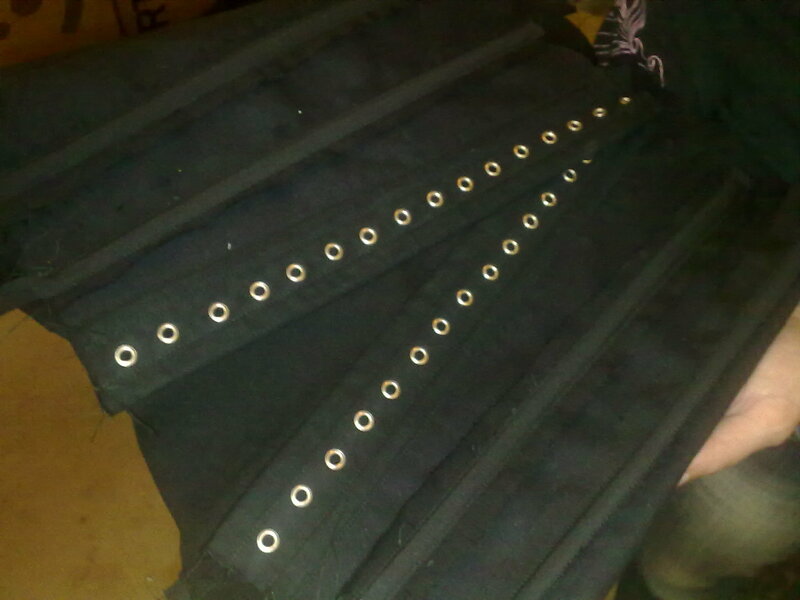 A vanity panel will also be attached behind those to hide any skin that would otherwise show if the corset wasn’t laced to a close. A top layer of black cotton will go over all this hiding all the bone lines beneath it and allowing us to print or embroider patterns on as we desire, though for historical accuracy the one used for Flight will just be plain. Corsets have only recently begun being worn on the outside of clothing rather than as underware so there did not need to be any patterns on them, with them being hidden at all times. I’ll post some more photo’s when the whole thing is finished, with top layer and all the laces.